What do you want from a browser: lightning speed, a lean interface, or a host of innovative features? Safari can satisfy all these requirements. Most PC users likely know of this browser as Mac-only, but there's a Windows version as well, and version 4 of it is good enough that you may want to switch from your current browser. 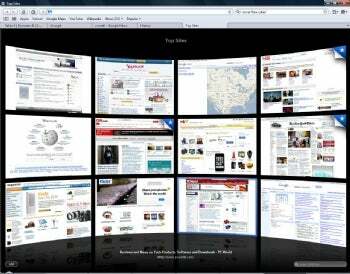 Safari 4 offers innovative features such as Top Sites, shown here. Like Opera and Chrome, Safari 4 is exceedingly fast. On all the sites I visited, it seemed to bring up pages more quickly than either Internet Explorer or Firefox. But there's more to the browser than just speed; it has some nifty features as well. Probably the biggest addition to Safari in its newest incarnation is Top Sites. When you open a new tab, a page opens that displays thumbnails of the sites you visit most frequently, and they're displayed (with Apple's usual flair for style) in 3D fashion. If any of the pages have been updated since you last visited, you'll see a blue star in its corner. Another notable Safari feature is Cover Flow, which lets you browse through your history list and bookmarked sites visually, letting you see previews of the sites as you go through them. It works in much the same way that you flip through your album art in iTunes. Also useful is the ability to search through your history list or bookmarks. You can also tear off tabs and launch them in their own browser windows by dragging them, and you can recombine windows in a similar way. That's not to say everything is perfect in Safari browser. For one thing, the text for the titles of tabs is extremely thin and can be difficult to read. More annoying is that when you install Safari the Home button is not visible by default. To turn make it visible, click the icon of a gear on the upper-right hand side of the screen, select Customize Toolbar, and from the screen that appears, drag the Home button to your toolbar. The same holds for getting access to some other features, such as your history list--in the default installation, the button for accessing your history list is not displayed. You can tell Safari to display that button as well, in the same way you make it display the Home button. These are small quibbles, though. If you're looking for a very fast browser with several innovative features, Safari is worth a try.